Here is everything you ought to know about water heaters to prevent them from exploding. Conventional tank-type water heaters have two types: fuel-fired and electric. In addition to heating the water, the tank-type water heaters also store water until it’s used. Therefore, every tank has an insulation system to ensure that the water stays warm. Fuel-fired heaters have burners that run on gas or oil, and have vent pipes to get rid of exhaust gases. Water tanks have a system of supply pipes located at the top. These pipes supply cold water to the tank’s bottom, while hot water is taken from the top. Moreover, these tanks have a temperature and pressure (T&P) relief valve. This ensures the safe limits of temperature and pressure inside the tank. Electric heaters have power cables that connect the heater to your house’s electric panel. Two heating elements—one located in the middle and one at the bottom of the tank—are used for heating water. A thermostat is incorporated in the heater’s mechanism to sense the water’s temperature. When temperature gets low, current is allowed to pass through the heating elements. When the pre-set temperature is achieved, the switch opens and the current stops. These are the conditions that can lead to a water heater explosion. If your heater is leaking fuel, the ignition flame can ignite it, and result in a disastrous explosion. When water is heated, its volume increases. Consequently, the pressure increases inside the tank. If the pressure exceeds a safe limit, the tank can explode. The T&P valve releases water from the tank to lower its volume inside. Resultantly, pressure is reduced. If this T&P valve malfunctions, your tank’s pressure levels can exceed to dangerous levels. Protect your family’s safety and save yourself from spending a hefty amount of cash on repairs by ensuring regular maintenance procedures for your water heater. Here are a few tips to ensure the safe working of your water heater. Get regular tune-ups from professional plumbers to ensure there are no gas leaks and that all the circuitry installed in the heater is working properly. Check your T&P valve regularly to make sure it’s working properly. Keep temperatures low—between 120-130 degrees Fahrenheit—to prevent damage to the water heater. Leave the installation and repair work regarding water heaters to the professionals. This prevents improper installations resulting in costly repairs. For reliable installation or replacement of water heaters in Palm Beach County, FL—reach out to us and we’ll get the job done in no time! Your 1 Plumber prides itself in providing exceptional plumbing services to its customers. 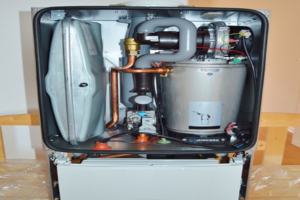 Our technicians are highly experienced in troubleshooting, identifying and repairing water heater problems. Contact us to get a quote or book an appointment online!